Costco's supply chain management is all about "minimizing the fingerprints" which makes them one of the most efficient operators in the business. Costco has an online delivery platform that offers free shipping to customers if their orders are $75+. They have several overseas opportunities, and are continuously expanding abroad. Costco has one of the best supply chain management systems in the grocery industry. They are currently trading at a 52-week high, and based on many valuations, they are overvalued. It is no secret that retail is struggling. Consumer sentiment and consumer credit are at all-time highs, but retail still lags. A lot of companies have attempted to remake themselves, but cannot seem to get back on their feet. JC Penney had an extreme makeover, but the company is still floundering. Sears is a lost cause. Toys R Us is gone. So what does this mean for the future of retail? Amazon is known to be a massive threat to brick-and-mortar stores, and leads the advent of the e-commerce wave. 75,000 retail stores are expected to close by 2026, due primarily to the growth of online shopping. 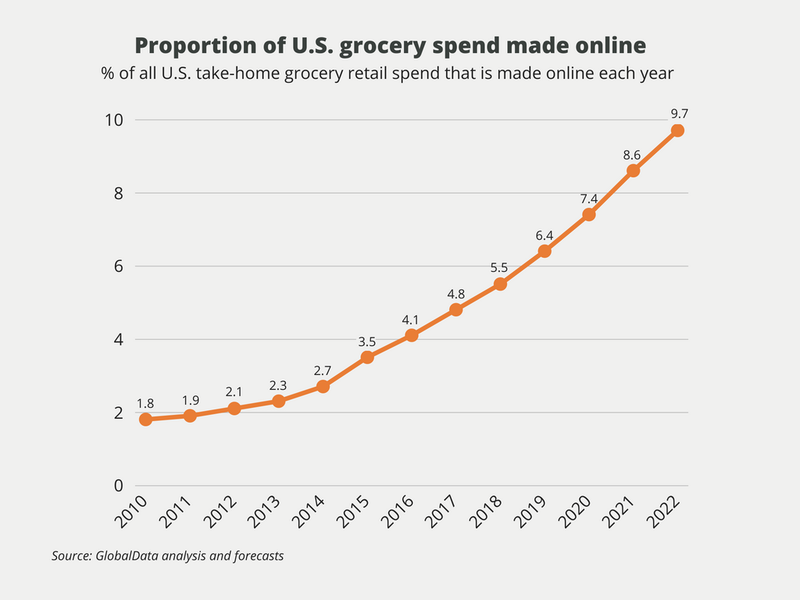 The growth of online retail affects every business, including grocery stores. Right now, more and more consumers are purchasing their groceries online. Currently 5.5% of all grocery spending is digital, which does lag behind the 18.9% of apparel and 10% of homeware purchases made online. However, that's expected to change. By 2022, the number of grocery sales online are expected to double, becoming a $130B market opportunity. There are several options for fast shipping and delivery methods, like Amazon Prime. There are also pickup options, like Kroger's Clicklist. 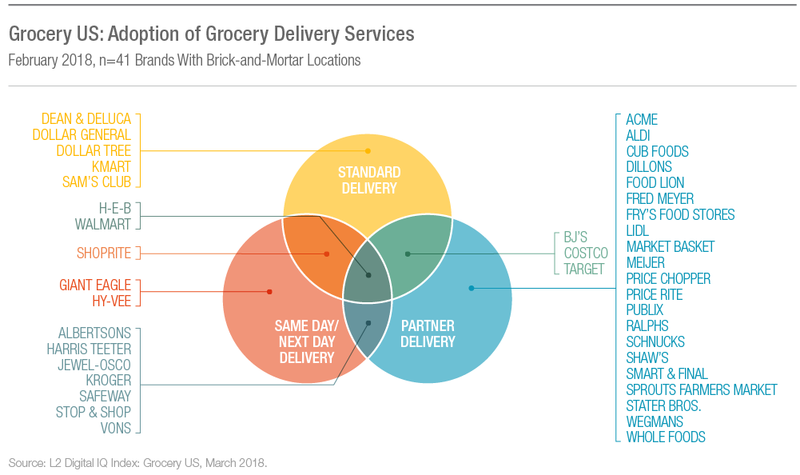 The grocery industry appears to have well-oiled supply chains, ensuring maximal efficiency between product order and product delivery. 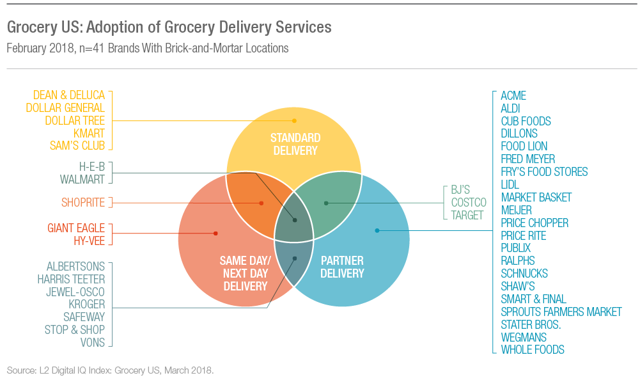 The grocery delivery market is currently intertwined with third-party digital shopping interfaces. Right now, 42% of grocery stores rely on some sort of third-party delivery system, like InstaCart, to provide at-home delivery to consumers. Costco Wholesale Corporation has their own standard delivery, offering free 2-day shipping on orders over $75. Costco is also the master of the supply chain, with direct buying relationships with the producers of the merchandise they sell. They also utilize a cross-docking system, which optimizes their entire supply chain management system. Costco's supply chain and strong financial statements make them a good company to keep an eye on, but the company is currently trading at pretty high premium, making them at bad deal at their current price. Costco's entire business model is efficient. They have no bags at checkout, and operate solely through bulk product sales. The products are shipped in on pallets, which they remain on until they are sold to reduce transport and labor costs. They have a wide variety of goods, including jewelry, clothing, furniture, and home supplies. Their most common item sold is toilet paper. They are the largest wine seller in the U.S. They are also the second largest auto dealer in the country through the Costco Auto Program, selling 520,000 cars in 2017, compared to market leader AutoNation's 563,000 vehicle sales number. They are the fifth largest optical company, and the 14th largest pizza chain. As evidenced by their leading market share in several core businesses outside of groceries, Costco is well-diversified. That allows the company to support their main model of retail sales. It also allows them to vary their revenue stream, and get exposure to a variety of industries. But Costco does not rely on product sales to grow. Right now, membership fees account for 80% of their gross margin and 70% of their operating income. They have 50.4M paid members and a total of 94.3M cardholders. They have an 88% membership renewal rate, which is extremely strong. That strength carries overseas. Most big box retailers fail when they attempt to go abroad. Costco doesn't. Their memberships are 10 times greater overseas in the first 10-12 weeks of a store opening as compared to the US. However, the retention rates are slightly lower, hovering around 82% renewal rates. Despite the strong overseas growth numbers, Costco is still dependent on the US and Canada for sales, with 87% of 2018 revenue coming from those two segments. Also, 30% of their US revenue comes from California. The company is investing abroad, with strong focus on Asia and Europe. 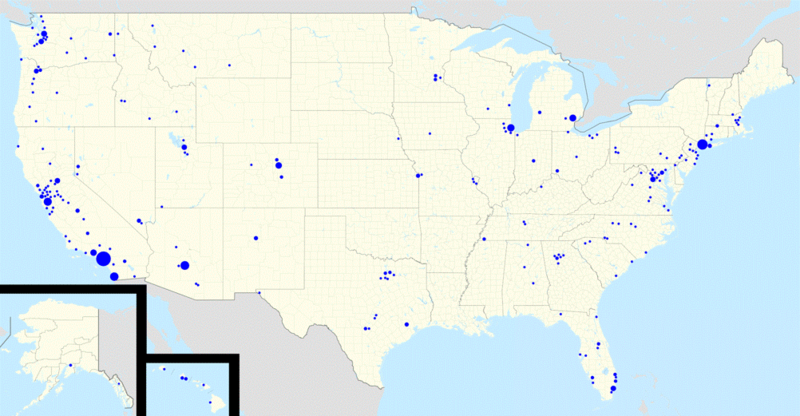 They have plenty of room to grow both domestically and overseas. They currently have 768 locations worldwide, and opened up 25 stores over the course of 2018. As the middle class continues to grow abroad, that should give Costco a strong foothold in those markets. Costco also has a vertically integrated supply chain, including buying products directly from the manufacturers and using their Business Delivery Fleet to get the products to their depots located across the country. They utilize "cross-docking" which gets the shipments to the stores with as little storage time as possible. They also have an innovative inventory system technology system called "Collaborative Retail Exchange", developed in part with Information Resources, Inc in 2004. The system is essentially just-in time inventory, taking into account both lead time and a sales cushion to find the best reorder inventory point, at which the product is immediately replaced. Costco is the very first chain to "go fully vertical into meat production" breaking up the Tyson and Perdue chicken monopoly. Costco currently sells 60M rotisserie chickens each year. Building out their own growing process will give Costco control over 40% of it's chicken supply, at a fixed price of $4.99 per chicken. The chicken operation will be based in eastern Nebraska, processing 2M chickens per week. The growth available there will allow Costco to capitalize on the 8% Y/Y growth in rotisserie chicken sales that they've experienced since 2010. They are also using Zest Fresh "manage the fresh food supply chain to maximize delivered shelf life, reduce store waste by 50 percent or more and deliver value that drives customer satisfaction". Costco is using Zest Fresh to make sure that their fresh produce doesn't go to waste, which will help them to operate more efficiently, and reduce the overall cost of goods sold. Overall, Costco's Supply Chain Management can be summarized in three words: "Minimize the Fingerprints". They purchase goods directly from manufacturers, preventing middle-man interference, and ship them to Costco depots, which then get shipped to Costco stores, all in under twenty-four hours. The full pallet is then rolled into the store. Customers then put it in their cart, and then a Costco employee touches it for the first time at the cash register. At traditional retailers, there are at least 5 different touch points, and even more if there is a middle man in the equation. Touch points add ~0.25 cents in cost to each product, which is why Costco is so operationally efficient. They have large warehouses, an integrated supply chain, and have made the process from manufacturer to consumer as simple as possible. Costco outperforms on both a top-line and bottom-line basis. They've experienced strong growth in revenue, especially compared to their competitors Target and Walmart. The company has trended upward since 2016, posting almost 10% growth for the past two years. Their net income has grown by 14% and 16.98% for 2017 and 2018, respectively. 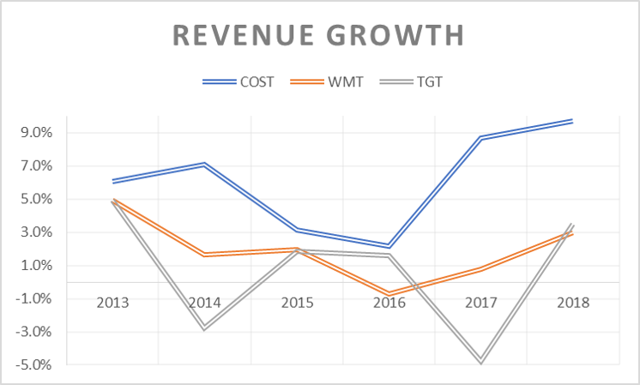 The fact that the company has been able to increase net income at a higher clip than revenue means that they are actively reducing their overall operating expenses while still posting positive growth. They also have strong profitability metrics, with a 7.3% ROA, a 14.8% ROIC for 2018, and a 26.3% ROE for 2018. Costco does not have as wide of margins as WalMart and Target, which is a caveat of their business model. Their gross margin is ~12.4% less than WalMart, and ~17% less than that of Targets. They do carry a higher asset and inventory turnover than both Wal-Mart and Target, which once again aids in their overall operational efficiency. They also have a shorter days payable outstanding, which is good, considering how quickly they turn products over. They have a short lag time between product sale and receipt of payment. They have strong debt management metrics, with a 53.2% debt to equity and a 67.9% total liabilities to total assets ratio. Overall, Costco has extremely healthy operational, solvency, and liquidity ratios, especially when compared to the industry as a whole. Costco has incredible metrics, and is a great company. They have built out a little niche for themselves in the industry, and should see relatively strong growth for years to come. But right now, they are trading at a 52-week and all-time high. Based on my DCF calculations, as shown above, the stock has a potential downside of 50% at the current stock price of $246. Costco has an expected growth rate of 4.9%, based on my calculation of an expected return on invested capital and retention ratio, and carries a weighted average cost of capital of 8.8%. On the low end, the stock has a potential of a negative 61% return and a high-end potential of a negative 32% return. The company has a free cash flow yield of 2.23%, based on its current free cash flow of $2.3B and enterprise value of $106B. Even with a P/E model, as shown above, the stock still has little room to the upside. If the company hits high on its earnings estimates, there is still only 6% room to the upside for the next year. On the expected side, there is a 4% loss. This is relatively in-line with Capital IQ estimates as well, with those analysts pricing the stock in at a median of $160, as shown below. Overall, Costco is a great company with a great plan moving forward. However, there will have to be some compression in their share price before they can be considered a good buy. Waiting until the price dips below at least $236 would be the best course to take to save your portfolio from taking a hit. That being said, Costco is a strong company and might be able to maintain their current valuation. There is also talks of a special dividend coming soon, which would boost overall investor payoff. For me, I am going to take the backseat and purchase when it's a bit closer to a more reasonable share price.